The best place for storage in your garage are the walls. Here is where a little pegboard action can make a huge difference. 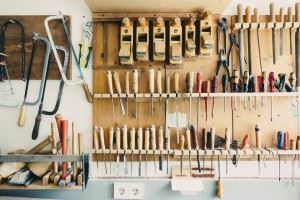 Almost everything you have in your garage from rakes, shovels, sporting equipment and tools can be hung on a pegboard. You can also install a shelf along the length of your garage that drops down just a few feet from the ceiling. Think of it as a loft for your stuff. By getting all these things on the walls you have more room to park your car in their once again. Your kid’s room is probably the most cluttered place in your entire home. It helps if you can provide your kid with the necessary organizing items to keep that clutter under control. For instance, you should put all their books in alphabetical order. Not only will this help you find them but it will also teach them how to use the effort! A wicker trunk or basket with the lid is a great place to put stuffed animals and other toys. Picking everything up off the floor before bedtime is a good habit to get into. Just as you should toss out expired food in the kitchen, you should also toss out expired medication in your bathroom. You might find that you can clear out half your medicine cabinet that way. As for organizing your toiletries, make a bag to caddy hung on the back of the bathroom door or cabinet is a good way to go. Instead of wasting time sorting through your laundry you should set up three baskets: one for delicates, one for whites and one for color. Your kids can get into the habit of dumping their own close into the appropriate basket. This will make the laundry day go a lot smoother. As you make your way through your home and garage, you are sure to come across a lot of items that could be tossed out. Some of these things might fit into the trash but a lot might be too big for the weekly pickup. That’s where Junk King Contra Costa to make a big difference. One call to these junk removal pros will have all your unwanted rubbish hauled away in a single session. Junk King Contra Costa provides the manpower and the truck space that you need to get rid of all your unwanted junk. Imagine what how that can help get your home organized. This entry was posted in Contra Costa Junk Removal and tagged clutter, home organized, Junk King Contra Costa, rubbish on June 26, 2017 by Junk King. Last updated June 26, 2017 .